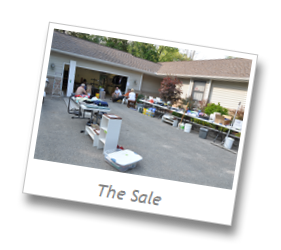 We’ve been in moving sale mode since Fourth of July weekend, with the most serious (and full) days last Friday and Saturday. A half off sale today topped off the frenzy and reduced the piles even further. We are very pleased with what’s left: a stack of items that will be donated to Habitat for Humanity, and some things that will go to the local library and the Salvation Army. I knew the adventure had officially begun the morning the mattress went out the door and Jim came home with a blow up bed. Meals are becoming increasingly creative, between using up the last few items in the cupboards and fridge, and preparing them with one cookie sheet, a saucepan and a frying pan (the ones I new nobody would buy) and serving them on our two plastic bowls with assorted plastic cutlery. We’ve talked about eventually adding a favorite recipes section to this site, but I don’t think any of them will be generated from this leg of the adventure. When you’re selling absolutely everything in your home, naturally people are curious about where you’re going. So we shared the vision of our adventure with inquiring shoppers, and we heard everything from “isn’t that going to be cramped?” to “wow, I’ve never met anyone who actually went after their dream before”. Most left with a few new treasures under their arms and wishes for a safe adventure. When one person said, “Happy sale-ing”, Jim and I looked at each other. “Did they mean ‘happy sale-ing’ or ‘happy sailing’? With a sigh, we agreed we can’t wait until it’s the latter, not the former.